Welcome!! We are so glad you found us! 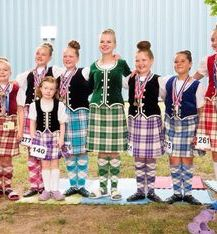 Tara's School of Highland Dance is an award winning dance studio, located in St. Catharines and Welland. We offer traditional highland dance lessons in a fun, dynamic, recreational setting. We participate in yearly exams, choreography competitions, local performances and Scottish competitions at the beginner level. Traditional highland dances as well as contemporary highland choreographies are taught to all age groups. We welcome students from ages 2.5 years and up, and both lads and lassies are encouraged to try! When I hear the bagpipes, it makes the hairs on my neck stand on end. It always makes me weep.